About 98.9 million American adults have borderline high cholesterol, and 31.9 million of those men and women have high cholesterol. It’s crucial that everyone, even currently healthy adults, watch their cholesterol because high cholesterol can have a serious and negative impact on the heart and, by extension, the whole body. The cardiology specialists at Healing Hearts Clinic, with three convenient locations in Conroe, The Woodlands, and Huntsville, Texas, are here to help you deal with high cholesterol and its consequences. Book online or by phone today. A healthy cholesterol reading is total cholesterol level of under 200. This breaks down as: high-density lipoproteins (HDL) of 40 or higher, low-density lipoproteins (LDL) of under 100, and triglycerides under 149. A borderline high cholesterol reading is a total cholesterol level of 200-239, which includes LDL of 130-159 and triglycerides of 150-199. HDL level isn’t factored into this calculation because it’s the “good” cholesterol. A high cholesterol reading is 240 or higher, which includes LDL of 160 or more and triglycerides of 200 or more. Again, HDL level isn’t considered in this evaluation. High cholesterol is a serious health issue, but fortunately, it's often a controllable one. How does high cholesterol connect to heart health? When you've got an excess of LDL cholesterol in your blood, it begins accumulating on the walls inside your coronary arteries, and sometimes in peripheral arteries as well. The cholesterol buildup, called plaque, narrows your arteries and can eventually block them completely. This results in a lack of blood to your heart, which could result in serious or fatal complications including heart attack and stroke. High cholesterol diagnosis typically starts with a blood test called a lipoprotein panel. 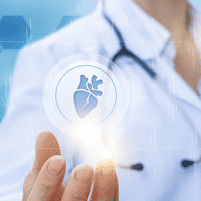 Your cardiologist may also check your heart function and blood pressure, either in-office or through a home monitoring device, if they suspect that your cholesterol level is connected to another medical issue. Can I lower my cholesterol naturally? Sometimes, it's possible to lower cholesterol with only dietary and lifestyle changes. Your Healing Hearts Clinic cardiologist may recommend limiting saturated fat intake, exercising regularly, quitting smoking, and losing weight if you're overweight. However, if you can't lower your cholesterol significantly with these measures, you may need treatment including medication or surgery. What is the medical treatment for high cholesterol? Your cardiologist may prescribe medications including statins, PCSK9 inhibitors, bile acid sequestrants, ezetimibe, fibrates, lomitapide, mipomersen, or niacin. If medicine isn't sufficient, and you're suffering from coronary artery disease or peripheral arterial disease, your cardiologist may recommend atherectomy surgery to remove the plaque from your arteries. Your Healing Hearts Clinic cardiologist helps with cholesterol diagnosis, treatment, and follow-up to help you improve your heart health and overall wellness. For more information, book your appointment online or call Healing Hearts Clinic today.